“Growing With” is an invaluable resource to parents currently raising or preparing to raise teens and young adults. The research is diligent and applicable in equipping parents to come alongside their children during the tricky growth spurts they go through. As a parent of two tween girls, I drank in every spiritual sentiment and educated formula presented in this work. It will be a resource I go back to as they grow, and I am able to reapply the authors’ insights as my children enter different stages of young adulthood. I am appreciative of the warm and relatable tone which this book is written in, despite all of the research packed into it’s pages. The book is broken up into four sections, “Growing With Parenting,” “Thriving in Family: Withing,” “Thriving in Faith: Faithing,” and “Thriving in Future: Adulting.” It’s easy to read. Those that are raising or working with teens and young adults …even those in the preparatory tween stages …will get through the content quickly. It can be difficult to figure out how to talk about all of the awkward and hard topics with our teens and young adults. 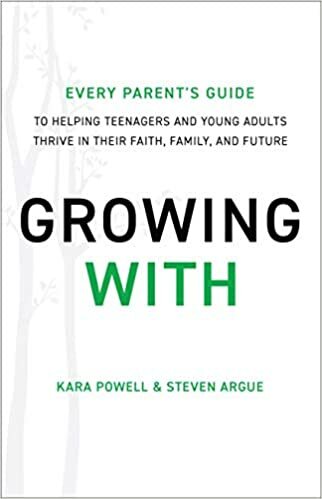 Powell and Argue take the guesswork out of “if” we can come alongside and parent young adults well, and faithfully guide parents in a relatable “how to” we can all employ in our everyday lives. I highly recommend this book to parents raising teens and young adults, and those that work with or volunteer their time in youth groups for kids these ages. Next Post The Laundry …Tackling Tough Transitions.